Bazouges la Perouse, Brittany, France. 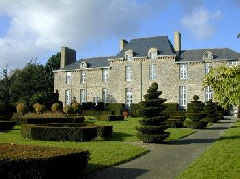 Set amid its own celebrated gardens (a historic monument in themselves), this beautiful 17th century house is located close to the Brittany-Normandy border. Former guests include Honore de Balzac, Musset, Chateaubriand and Victor Hugo – a suite bears the name of the latter. Chateau de Ballue offers 5 guest rooms in total, each of which is individually furnished and named (the Diane, the Florence and the Suite de France amongst them). St. Malo, Rennes and Mont St Michel are all within easy reach for those travelling by car.